For seven days I was afflicted because the value of my retirement was not deposited. Until I was able to talk (after many days and hours on the phone) with the Social Security office. They had suspended my retirement (they said they sent me a letter, but I never received it), because I needed new exams. This after 11 years, as I cannot work. They gave me a last minute appointment, without giving me time to take recent tests and communicate with all my doctors. Even so I got a certificate, I took scans from the beginning of the year that said my spine was doomed (doctor's words). The doctor examined me, saw my exams. To my surprise, she asked if I was Luizinha de Nana. She had my entire record of social movements and human rights defense. Conclusion: she discharged me, said that she recognized that I had the column with serious problems, that I felt chronic pain, but that I was intellectually very active, so I should go back to work. I told her the activism and writings I make are from home, when it's possible, and unpaid. That I would never be able to follow a routine of 6 hours of driving plus 8 sitting and for whole weeks. She said my mind was very active and could be used to get back to work. I said that when I give a lecture, people will pick me up at the house and drive me back. (I never earned a penny for any lecture I've done.) I consider it a voluntary and social activity. That's why I particularly conclude, the Social Security wants non-thinking beings, who do not express their thoughts, who do not fight at home with an old notebook, who do not express themselves against the government, who does not fight for people to have their rights recognized. They want my cerebral palsy. Once again I express my fears. I hope I have an answer from the organisation that, according to its objectives and values, should defend us. We are in pre-election time. According to the polls and the political situation of the country, where corruption is significant and militarization is already a reality in the state of Rio de Janeiro. I have many fears. If Bolsonaro wins I will be on the front line in relation to all his ideologies. 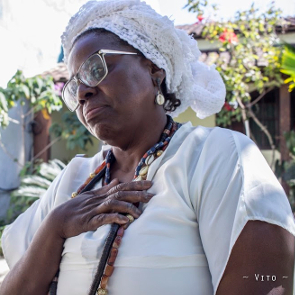 I am black, woman, candomblé, defender of Human Rights and I profess this clearly. If Mr Haddad wins, we are in danger of an intervention or coup d'état (it is not only I who think so) that the country could go through difficult moments of authoritarianism, divisions and internal wars. In both scenarios I will be on the front line. This problem is so visible and profound that it led the UN to accept my report. It is how the NGO Transparency International put me in their campaign against corruption. I have had my retirement suspended and the doctor called me by my religious name. I have had my wall at home damaged with paintings. I would like to have an answer on the actions to be taken and steps that can be taken. I feel in danger.